In order to strengthen and enhance the quality of Diploma in Surveying programme at JNP and to improve the overall quality of Surveying in Bhutan, a Memorandum of Understanding (MoU) was signed between the National Land Commission Secretariat (NLCS) of Bhutan and Jigme Namgyel Polytechnic (Royal University of Bhutan) on May 12, 2015 in Thimphu. The MoU was signed by the Hon’ble Secretary of NLCS and the Director of JNP in the presence of the Hon’ble Vice Chancellor of RUB and officials from NLCS and JNP. 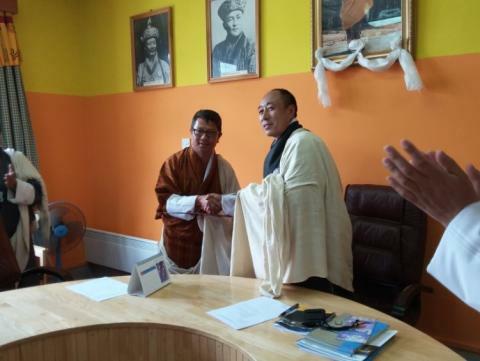 Dasho Pema Chewang, Secretary (NLCS) commended on the initiative and said that the MoU is expected to help develop Surveyors within the country and it would also enable NLCS to design and provide appropriate professional development programmes to the in-service Surveyors of NLCS through JNP. He thanked the Royal University of Bhutan and JNP for the support provided and said that NLCS and JNP should work together to explore niche areas that are critical for Bhutan in the area of surveying. He further reiterated that NLCS would render all possible support to JNP that is necessary in improving the quality of training in the area of Surveying. Dr. Andu Dukpa, Director of JNP thanked NLCS for the support and said that perhaps this is one of the MOUs where the impact would be felt immediately after the signing of the MoU. He was referring to the attachment of an expert surveying official from NLCS as an Adjunct Lecturer at JNP. Dr. Andu thanked NLCS for the continuous support to JNP with regards to the Surveying programme and added that JNP and NLCS will continue to work together to strengthen and enhance the overall quality of Surveying in Bhutan .